Garmin echoMap 43dv has an average rating of 4.67 out of 5 based on 3 user reviews. Affordable and compact, the unit has plenty of power and features that capably enhance any angler’s ability to find the fish in fresh or salt water. The high-contrast color display has adjustable backlighting, and when combined with the swivel mount, ensures that images remain viewable regardless of environmental light conditions. The 4.3-inch screen displays images in 480 x 272 pixel resolution. The keypad control buttons are self-explanatory and clearly marked for power on/off, select, home and mark along with zoom in/out, back and four-way direction function. The factory installed LakeVu HD mapping system beats competitor models with more than 17,000 lake, reservoir and river maps displayed in extreme detail. The maps additionally provide HD underwater views of 5,700 lakes with the options of safety contour shading for shallower locations. See hazards at a glance. The maps also illustrate a long list of details concerning location points of interest that include roads, highways, bridges, fishing areas, boat ramps, docks, marinas and campgrounds. You can create up to 5,000 waypoints to navigate back to favorite fishing spots fast and easy using the built-in antenna plus the 5Hz GPS/GLONASS receiver that together ensure seamless image updates 5 times per second. The Garmin Auto Guidance technology immediately searches charts to display a virtual path to help avoid hazardous areas and obstructions. Calculate paths by inserting points at different landmarks or stops along a designated route. See problem areas quickly. Calculate arrival times at any point on the way, which is fantastic for timing bridge openings or other necessitated timed events. Save all of the data on a removable microSD card. The single microSD card slot also extends memory if opting for accessory maps that might include the BlueChart g2, the BlueChart g2 Vision or the LakeVu HD Ultra. The LakeVu Ultra has high-resolution shading in addition to depth range shading and dynamic lake levels on more than 70 lakes. The Garmin 43dv comes equipped with 77/200 kHz dual-beam sonar via a single transducer. 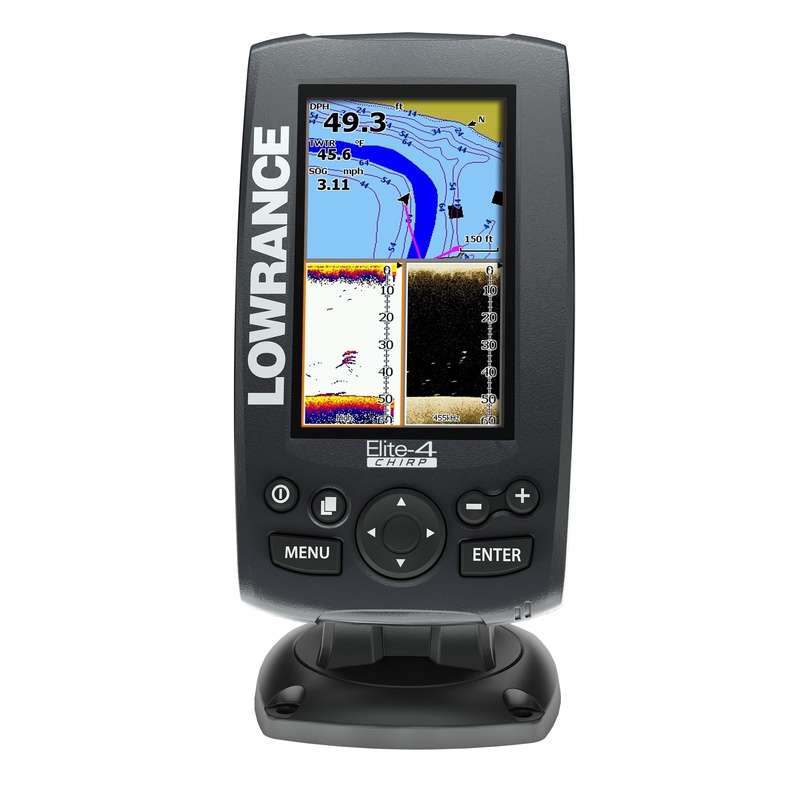 The HD-ID sonar and the DownVu scanning sonar both provide picture perfect images while displaying bait fish, game fish, vegetation or terrain structures in depths of up to 750 feet. Display also indicates vessel speed, water temperature and depth graduations, which takes guess work out of determining the depth of objects. The device also provides the option of viewing maps or sonar images in single or combination split-screen mode. In addition to providing real-time imaging, the Garmin echoMAP allows anglers to back-up and review the history. The digital recording feature enables quick data download onto a PC. Recording makes it convenient to transfer routes or waypoints from one unit to another via the SD card and HomePort planning software. You can plug the cords directly into the mount for quick installation or removal of the unit. When done fishing for the day, simply disconnect the device and take it indoors for safe keeping. The Garmin echoMAP 43dv makes a nice addition to any tackle box. Easy-to-use features appeal to novice or experienced anglers alike. You can get a great deal on Garmin echoMap 43dv here. The unit performs great on the features it has. The display is clear and the sonar is more accurate than I expected for a $300 unit. I bought this one to replace my aging unit from the 90s and it has made a world of difference. If you are looking for a starter or still using outdated equipment like I was you can’t go wrong with the echoMap 43dv. Anyone halfway serious about fishing should start with one of these. All in all this is a solid unit. My biggest gripe is that the cables tend to fall out of the back of the unit fairly easily when I try to use it without the included bracket. An easy work around for this is to just hold the bracket with the unit rather than mounting it, but either way not a big deal. It is easy to setup and the menus are simpler to navigate than many sonar/GPS units. The included transponder has been really accurate in the month or so I have been using it. It does pretty much everything Garmin says it will. Anyone who buys one will be happy with what they get for the price. This depth sounder has in my opinion the best value for money. I use the European 42dv version, and am more than happy with it!